and open-mindedness in order to repair public discourse? This is the central question guiding Humility and Conviction in Public Life (HCPL), a research and engagement project investigating how intellectual humility—being aware of our own cognitive limitations and biases, and being responsive to the evidence—can promote healthier and more meaningful public conversation. Sponsored by generous grants from the John Templeton Foundation and the University of Connecticut, HCPL is an unprecedented combination of research and engagement. 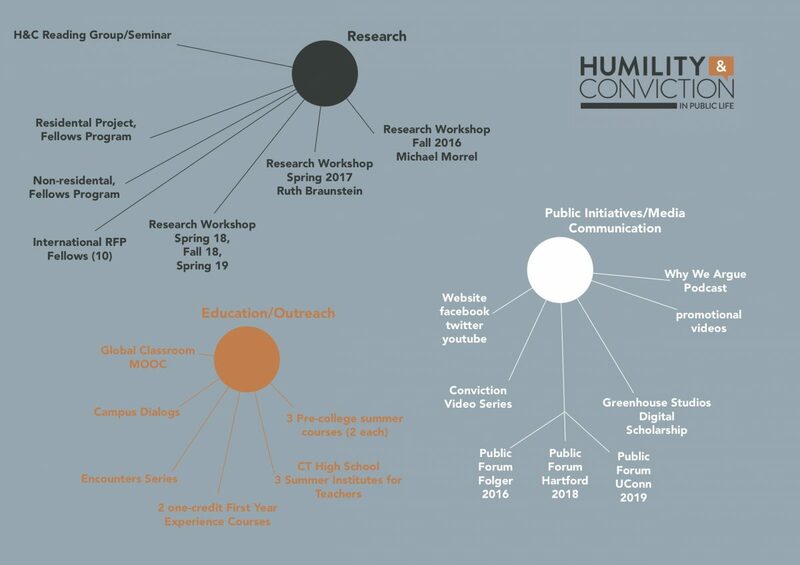 Activities include summer institutes for high school teachers on how to incorporate intellectual humility into their classes, a free and globally available online course on self-examination and public life, partnerships with public institutions and community groups in Hartford to practice humble dialogue over the divisive issues of our day, and a series of awareness-raising media initiatives. Among its applied research activities are a Visiting Fellowship program hosting leaders from the academic, media and non-profit sectors; an international, competitive funding initiative to support interdisciplinary teams of researchers pursuing project themes; three research workshops hosted at UConn; and a partnership with UConn’s Mellon Foundation-funded “Scholarly Communications Design Studio” for the collaborative production of scholarly knowledge and new, dynamic ways in which to make it publicly available. The project is hosted by the University of Connecticut Humanities Institute, which has a history of sponsoring both publicly engaged and interdisciplinary research. As such, the Institute is a natural mechanism for implementing a project that seeks to apply research in the social sciences and humanities for the purpose of elevating the tone and outcomes of public discourse in our society. To participate in, and stay informed about, the exciting work of this project, please join our mailing list where you can learn about joining events, keep updated on research, and learn how to connect to other people and organizations working to instill a greater sense of intellectual humility in our national conversation.